It can be assumed that, regardless of grade level, all works fit the mission and goals set forth by Triplo Press for publication. Grade 1 Involves rudimentary levels in all four criteria. Rhythms do not progress beyond eighth notes, range reaches no higher than a g'' and technical and musical demands are minimal. Key signatures stay within two flats to two sharps. Grade 2 Introduction of triplet figures, but still no faster than eighth notes. Range to an occasional b''. The use of any key. Varied (but clearly marked) articulations. Few technical demands. Musical demands are elementary. Grade 3 In general, more musical awareness than Grade 2. Rhythmic complexity includes sixteenth notes. Range goes to an occasional c'''. Continued simplicity of arrangement and style, but musical content is on a more mature level, and, played well, are extremely effective. Most of the pieces written in the Cincinnati Herald Trumpet Ensemble series are in this category. Grade 4 Advanced young students (usually ages 16-18). Rhythms mildly complex, with the introduction of simple mixing of meters. Range utilizes c''' on a regular basis. Average technical demands, including same-note multiple tonguing. The player's understanding of musical and stylistic concepts become more important to rehearsal ease and success of performance. Grade 5 Continued sophistication of style and demands. Full sounding ensemble writing. Increased complexity of rhythms and mixed meter and time signatures. Range demands are routinely to c'''. Multiple tonguing and relatively complex technical demands. Endurance and power demands increase. Serious young performers at the collegiate level can handle this level. Grade 6 This is the level that most accomplished collegiate players and professional performers find most befitting. Without extreme technical demands, but with definite challenges. Range goes to e'''. Sophisticated musical demands. The use of smaller trumpets within the ensemble is common. The knowledge of style is extremely important to the success of these works. Grade 7 Still more sophistication. Strong collegiate or beyond. Higher level in sensitivity of ensemble and complexity within the composition. Endurance is also a factor. Grade 8 Very strong demands at every level. Complex rhythms and time signatures. Technique and range are musical considerations which do not take the level of the performer into consideration. Very challenging material. Grade 9 Virtuoso level in every respect. Part of the Cincinnati Herald Trumpet Series. In D concert, so this arrangement is a little tougher than some others in the series, but it is simple to put together and very effective. The melody moves from voice to voice so that no one takes the brunt of the relatively high tessitura. Excellent for teaching the piece.and the appropriate style. 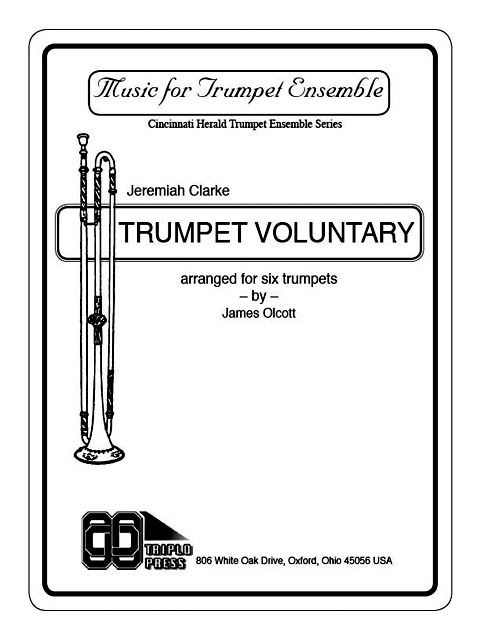 "(The Trumpet Voluntary is one of a set of)...extremely attractive and useful arrangements for trumpet ensembles.... simple, straightforward, and require a minimum of rehearsal time. They do not make extreme demands in terms of range or endurance... music is clearly printed, with no awkward page turns. (Olcott) demonstrates his usual expert arranging skill in providing as much variety and melodic interest as possible in the inner parts while rotating the melody among the players." MasterCard, Visa, and DiscoverCard accepted for retail purchases. Use the "Add to Cart" buttons to order securely over the Internet. IMPORTANT: If your order is not received within one week, please notify Triplo Press by email. In lieu of faxing, please convert your order to a PDF file and attach it to an email to us. For direct non-credit card orders (orders by mail), please include prepayment. Add $6.75 for postage and handling. When ordering from outside the USA, please purchase via credit card or send the order by email, including mailing information. Invoicing and payment will be processed with PayPal. You can re-download your PDF order if you were not able to after your order was complete.